What comes to mind when... What springs to mind when Adam Treloar hears these Magpie magic words? 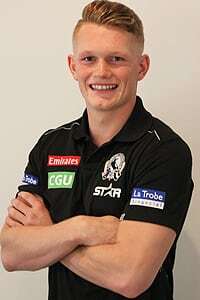 Adam Treloar has joined Collingwood after playing 79 games for Greater Western Sydney. Talented young midfielder Adam Treloar will call the Holden Centre home after Collingwood reached a trade agreement with Greater Western Sydney on day eight of the AFL Trade Period. The club exchanged picks No. 7 and No. 65 in the 2015 National Draft along with its first round pick in the 2016 National Draft for Treloar and the Giants’ pick 28. Selected by the Giants in 2011, Treloar raced to 79 games in his four years at the club. He enjoyed his best season to date in 2015, averaging 28 disposals and five tackles, just one disposal shy of E.W. Copeland Trophy winner Scott Pendlebury. General Manager of List Management Derek Hine said the highly regarded 22 year old will bolster Collingwood’s emerging list. “Adam has established himself as one of the competition’s most prolific young midfielders,” Hine said. Treloar capped off a strong 2015 season by finishing runner up in the Giants’ Kevin Sheedy Medal, his third top five finish in four years at the club. The midfielder said there were a number of factors that led him to choose Collingwood. “(Collingwood) has such a young list, a lot of them around my age, with a great mix of experience with Scott Pendlebury and Dane Swan and guys like that who I can learn off,” Treloar said. “A lot of the young guys that have made a name for themselves in the last year... they’re leading the way and that’s something I want to be a part of.